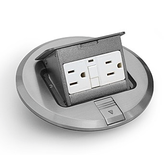 The Lew Electric PUFP-S is a 6" Stainless Steel Pop Up Floor Plate with a 15A Tamper Resistant GFI Receptacle. This style floor box conveniently provides hidden power to your indoor installations in either wood or concrete flooring. The PUFP-S when closed, provides a style power option that is virtually hidden when closed and not in use, giving your home a stylish option for indoor power solutions. This device is GFI protected and provides 15 amps with tamper resistant plugs. As a whole this power floor pop up is UL Listed, with it also being cUL recognized for installation in Canada. The PUFP-S is ideally installed in locations where you would like to have hidden power, potentially in the middle of larger rooms, so you do not have to run unsightly cords across your floor from a wall outlet. The device is not splash or spill rated, however in the closed position, the top is UL compliant to keep scrub water and dust out of the unit. To operate this device, simply push the slide button on the lid, and the top will tilt open to reveal your hidden power outlets.